You may remember these armwarmers from Christmas. Upon seeing the ones I knit for my youngest sister, another one begged, pleaded, & demanded a pair for herself as a Birthday gift. I’ve also taken this opportunity to write up the pattern and post it…although I could have sworn I’d already done that! Yarn: Paton’s Classic Merino Wool in black & brown. Perhaps half a skein of the brown (although I doubt even that much) and maybe a handful of yards of the black. Repeat these 2 rounds until 9 1/2 inches from the picot yo/k2tog round. At 9 1/2 inches, k17 sts (keeping to pattern), BO 4 sts (On the 2nd mitt, you will K29 (keeping to pattern), then BO4, k1). At the next round CO 4 sts using the backward loop cast on. Continue knitting in pattern, repeating decrease pattern at 1 & 2 inches past thumb hole. K1 round, switch to black. Sew picots down, weave in ends & enjoy! Edited on May 6, 2009…Missyfee seems to be the first person to knit & post pictures of these armwarmers on Ravelry. She edited the pattern for dk weight yarn & to be knit from the fingers and up the arm, then she kindly posted the details here. Enjoy! YOU are sooooo great! thank YOU!!!! Ian is just so cute standing there in his tie! Thanks so much for this pattern – I hope you don’t mind I modified it for a DK weight yarn and knitted them them from the otherway. 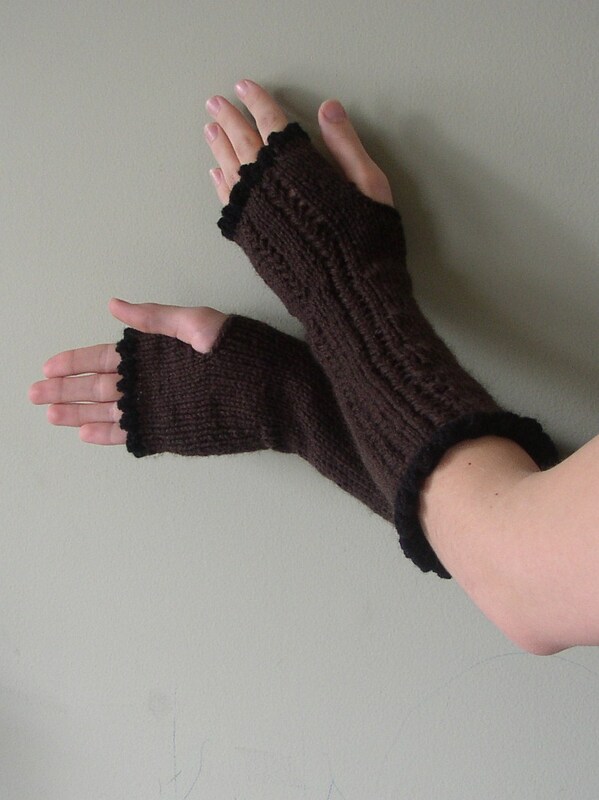 Hi – I love the look of these armwarmers – – I think I’m being quite thick, but what does ‘R’ mean in your pattern (Row? rep?) and what is R1 and R2? I’m being thick too, or maybe just old (been knitting 63 years) , what do the R, R1,R2 mean? What do the R1,R2, R men in your pattern? These look perfect but I’m also struggling to follow the short-hand in the pattern. Are they knitted on 3 needles in the round? Should have gone looking first. This website is handy. Can anyone help me? I really don’t understand how to get the scalloped edge at the top of the mittens. I haven’t followed the pattern exactly. I have knitted it all in Purl so my gloves aren’t inside out on my needles. I just want to be able to change colour and get that nice edge at the fingers. HELP! can anyone tell me what the “K pattern above” means in the following instructions? I dont know which “pattern above” this refers too. Novice knitter here, looking for a project when I finish my current dishcloth (I recently started learning at a group in church)… How difficult would you say this pattern is? The instructions look fairly straightforward but I wanted to ask before I show this to my teacher and she laughs at me or something lol. I’ve seen people knit socks for their first project! If you want to, you can definitely do it. You will probably need some help as I haven’t put in a lot of explanation, though. You will be learning to knit in the round, do 2 different types of decreases (k2tog & ssk), and yarn overs (yo). good luck!